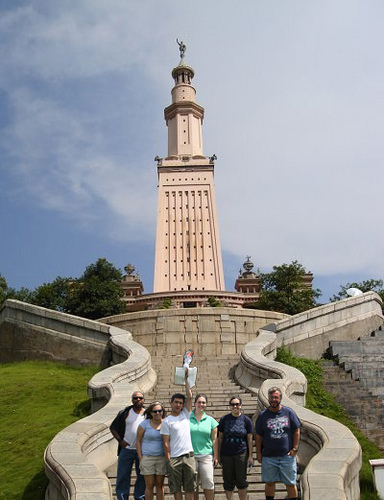 The Lighthouse of Alexandria, also known as the Pharos of Alexandria, was a tower built between 280 and 247 BC on the island of Pharos at Alexandria, Egypt. Its purpose was to guide sailors into the harbour at night time. With a height variously estimated at between 393 and 450 ft (120 and 140 m), it was for many centuries among the tallest manmade structures on Earth. It was one of the Seven Wonders of the Ancient World. So impressive was ancient Egypt's building efforts over the pharaonic period that it commanded two wonders of the ancient world. One, the Great Pyramid of Giza, was built near the beginning of Egyptian history, while the second, Seventh Wonder was mostly built by one of Egypt's last pharaohs, Ptolemy I Sorter, though he died prior to its completion. While the first still stands, the latter was destroyed, almost certainly by an earthquake. 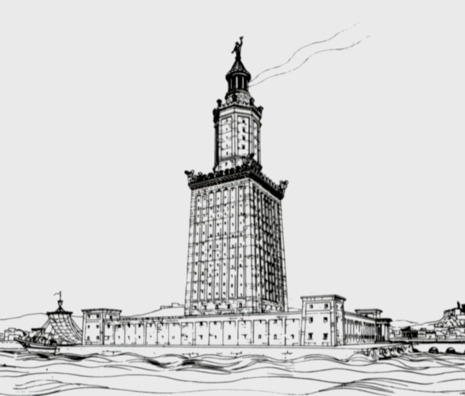 This was Pharos Lighthouse of Alexandria, which of the vanished wonders of the ancient world, was the last built and the last to remain standing. 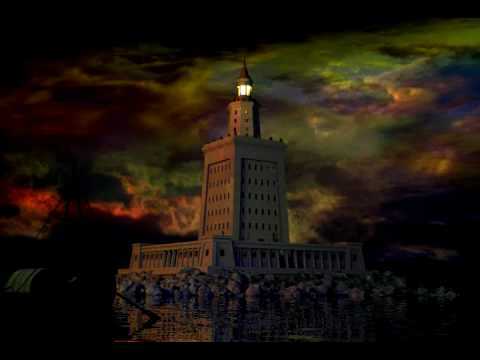 Pharos Lighthouse stood on the eastern point of Pharos Island some distance from the city center of Alexandria. Constructed at the beginning of the third century BC over a period of about twelve years and at an enormous cost and using considerable slave labor, Pharos Lighthouse was completed and inaugurated by the first Ptolemy's son, Ptolemy Philadelphus, in 283 (some say 279 BC, when Ptolemy Philadelphus held a festival to honor his parents). Prior to its destruction, it underwent a number of modifications by later rulers. The architect was Sostratos, a Greek from the Asia Minor city of Cnidus, whose name also appears on the sanctuary of Appolo at Delphi and on Delos. Though only the king's name was allowed on buildings erected during their reigns in the period, Sostratos got around this by also carving his own with a dedication, which was then covered with plaster. The consecration in honor of Ptolemy was then carved into the plaster, which over time peeled away leaving only Sostratos dedication, which provides, "Sostratos of Cnidus, son of Dexiphanes, to the savior gods, for sailors.